Do you need to rent a shipping container in Phoenix, AZ? Do you have a home remodel that needs to be completed, but you aren’t sure where you’ll put all the items from the room while it’s being redone? Rather than looking to self-storage for your needs, call Haulaway Storage Containers and have one of their shipping containers delivered right to your house today so that you can begin the work of remodeling your home the way you want it to be. 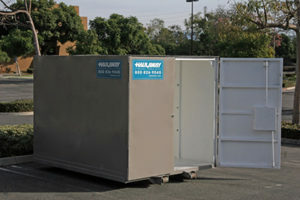 We have Conex containers as well as roll off containers. How is it better to rent a shipping container in Phoenix, AZ rather than use self-storage? First of all, you can have a variety if sized shipping containers to choose from, similar to a self-storage unit. With Haulaway you can choose a ten, twenty, twenty-one, twenty-six or forty foot container to give you the flexibility you need for your remodel. The beauty of having a storage container with the best price shipped to you is convenience. With self-storage you have to drive to the location and may not have access during the late hours. With a storage container in your driveway, you can walk outside and easily access anything you need right on your own property. Shipping containers used to only come in a couple of sizes, but Haulaway has learned that customers want more variety and have come up with the five sizes to be the perfect selection. Whether you need a small affordable storage container to hold your precious items from the remodel or you want to place the construction materials in the container during the project, when you rent a shipping container in Phoenix, AZ the name you should trust is Haulaway. Let them bring the storage you need right to your doorstep for an easy storage experience and convenient access.